There are three versions of the medal, one each for the Army, Navy, and Air Force. Personnel of the Marine Corps and Coast Guard receive the Navy version. 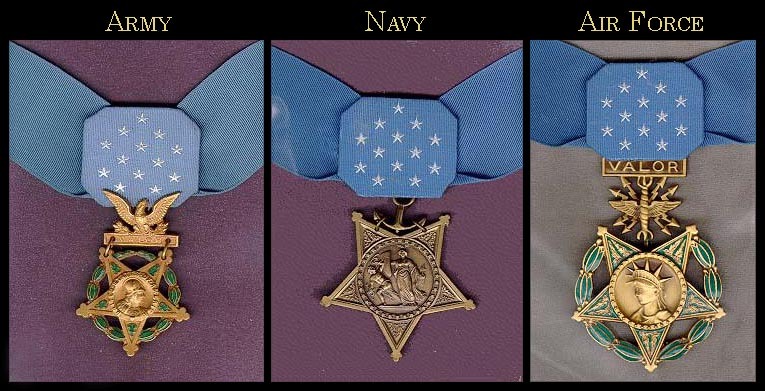 The Medal of Honor was introduced for the Navy in 1861, soon followed by an Army version in 1862. The Medal of Honor is the oldest continuously issued combat decoration of the US armed forces. The President normally presents the Medal of Honor in Washington, DC at a formal ceremony that is intended to represent the gratitude of the US people, with posthumous presentations made to the primary next of kin. According to the Medal of Honor Historical Society of the United States, there have been 3522 Medals of Honor awarded to the nation’s soldiers, sailors, airmen, Marines, and Coast Guardsmen since the decoration’s creation, with just less than half of them awarded for actions during the four years of the American Civil War. Note that one properly refers to those who have received this award as “Medal of Honor Recipients.” One does not say they “won” the medal—they received it. Note: March 25th is National Medal of Honor Day. Note: This is the first in a series focusing on awards for valor (heroism) presented by our armed forces. In the next edition of this newsletter we’ll feature the 2nd highest award for valor; for the Army it’s the Distinguished Service Cross; for the Navy it’s the Navy Cross; for the Air Force it’s the Air Force Cross. On January 10, 2019, Representative Julia Brownley introduced H.R. 445, the Help Hire Our Heroes Act. This bill would make permanent the Veterans Retraining Assistance Program (VRAP). The VRAP was started in 2012 to provide training assistance to unemployed veterans between the ages of 35 and 60 who are no longer eligible for the GI Bill. It provided up to 12 months of training benefits at community colleges and technical schools in occupations that the Department of Labor has identified as “high demand.” Since funding for this program expired in March 2014, the VA has not been able to enroll new veterans in VRAP. This program gap means that thousands of older, qualified veterans have been unable to access the resources which could help them find work. This bill would strike the end dates of the Veterans Retraining Assistance Program and would replace it with year to year authorizations. Troops, please write to your Representative to cosponsor and support passage of H.R. 445, the Help Hire Our Heroes Act. The VA didn’t just release its new standards for accessing non-VA care, it also opened public comments on those guidelines. Learn more about how you can submit a comment letting the VA know more choice is great for veterans. General retaliating against Green Berets? Yeah, yeah, yeah… Enemy artillery and bayonet duels and concentrated machine gun fire are all terrifying and all, but those are to be expected, and most people can develop fears of those things after watching a few movies about Vietnam. But actual service members have a lot of fears that aren’t exactly intuitive. These are the little things that make their lives crappy, and usually for dumb reasons. Things like Changing Batteries and—well, here they are. Nicolás Maduro’s regime in Venezuela is fortified by Russian mercenaries, Cuban paramilitary elements, Hezbollah, and Iranian Basij and Quds Force operatives. Even if the Venezuelan military defects to support interim President Juan Guaidó, they would still have to face up to the foreign irregular forces supporting Maduro. What is behind Iranian and Hezbollah penetration into Venezuela and other parts of South America? Yi, a 40-year-old Ohio restaurant owner who also goes by the name Don, traveled to Seoul last month to attend his father’s funeral. But airport authorities prevented him from leaving the country on Feb. 6 because he faced a decades-old accusation of draft dodging. South Korean police detained him for several hours. He was later released from custody but barred from leaving the country until March 2 pending review. Prosecutors later said he was guilty, but they decided not to pursue the case, according to Yi. Yi, who was born in Seoul but emigrated with his family at age 9, said he’s not angry about the experience. Yi said he received American citizenship while serving in the US Army from 2004 to 2012, including tours in Afghanistan and South Korea. South Korea, which has faced a threat from heavily armed North Korea since their 1950-53 war ended in stalemate, requires all able-bodied men to serve some two years in the military. It has strict rules governing conscription, including one that compels South Korean-born men to declare plans to remain abroad and change citizenship when they turn 18. Yi failed to do so. He said he didn’t realize he still had responsibilities in his native land and his detention resulted from a misunderstanding. World War II veteran Joe Cuba got two times what he wanted for his 100th birthday. The retired Air Force staff sergeant told caretakers at his Texas retirement community that he wanted to receive 100 cards to celebrate hitting the century mark on March 2. After staffers posted a photo of the war hero on social media, birthday wishes came pouring in to Cuba’s Brookdale Retirement Community home. “I thank all of you good people for wishing me well. You’re all so gracious to remember me,” Cuba said in a video message to his well-wishers. He expressed his gratitude not only for surviving the war, but for being thought of on his landmark birthday. Birthday wishes for Cuba reportedly came from as far as England and Poland. Some of those cards came from fellow veterans who served with Cuba during his two years in the military. Our Air Force has stopped accepting deliveries of its brand-new KC-46 Pegasus tanker only weeks after the first aircraft was transported from manufacturer Boeing Co.’s Washington state facility to McConnell Air Force Base, Kansas. The Defense Contract Management Agency (DCMA) halted deliveries Feb. 20 because of foreign object debris found in the aircraft, Air Force spokeswoman Maj. Malinda Singleton said. The Seattle Times first reported that the debris, which could damage the aircraft, led to a week-long grounding of the tankers and safety concerns from top service officials. The Air Force will not accept deliveries of the tanker until the production aircraft are cleared, and the service and DCMA have approved a corrective action plan by Boeing “that will prevent FOD in the future,” she said. The space agency reveals sci-fi-looking views of supersonic jets exceeding the speed of sound. Boeing Co. has unveiled a new concept for an unmanned fighter that would work autonomously alongside fourth- and fifth-generation fighter aircraft. Dubbed the Airpower Teaming System, the drone-jet hybrid would be a multi-mission craft using artificial intelligence to conduct intelligence, surveillance and reconnaissance missions to supply pilots with more information during a conflict, according to the company. The aircraft, which Boeing is co-developing with the government of Australia for that country, was unveiled at the Avalon Airshow this week. The jet is 38 feet long and can fly more than 2,000 nautical miles, the company said. It uses A.I. “to fly independently or in support of manned aircraft while maintaining safe distance between other aircraft,” according to its fact sheet. Boeing intends to hold its maiden flight sometime in 2020. The concept is part of the service’s Air Superiority 2030 road map, which the Air Force debuted in 2016. The road map outlines next-generation air dominance, defined as advanced fighter aircraft, sensors or weapons — or all of the above — in a growing and unpredictable threat environment. If you’re preparing for a career in special ops, training for a challenging tactical school, or even just getting ready for events such as Bataan or GoRuck, you need to prepare for rucking. The Air Force Security Forces Center and the Air Force Small Arms Program Office is fielding the gun to Security Forces units, according to a statement. The move is part of the Reconstitute Defender, which aims to modernize the service’s weapons. The M18 replaces the M9 pistol, which has been used by the Air Force for more than 30 years. The handgun will also replace the Air Force Office of Special Investigations’ M11 handgun and the M15 revolver, which is used for Military Working Dog training and dates back to the Cold War. Members of Congress are not our leaders—they’re our representatives. Are you happy with the way your representatives treated Supreme Court Justice Kavanaugh—or the way the House held a committee meeting to bash the President while he was in Vietnam negotiating with the North Korean leaders? In our Constitutional Republic it’s our job to critique our representatives. Some people left their car in the long-term parking at San Jose while away, and someone broke into the car. Using the information on the car’s registration in the glove compartment, they drove the car to the people’s home in Pebble Beach and robbed it. So, I guess if we are going to leave the car in long-term parking, we should NOT leave the registration/insurance cards in it, nor your remote garage door opener. Someone had their car broken into while they were at a football game. Their car was parked on the green that was adjacent to the football stadium and specially allotted to football fans. Things stolen from the car included a garage door remote control, some money and a GPS that had been prominently mounted on the dashboard. When the victims got home, they found that their house had been ransacked and just about everything worth anything had been stolen. The thieves had used the GPS to guide them to the house. They then used the garage remote control to open the garage door and gain entry to the house. The thieves knew the owners were at the football game, they knew what time the game was scheduled to finish and so they knew how much time they had to clean out the house. Something to consider if you have a GPS – don’t put your home address in it. Put a nearby address (like a store or gas station) so you can still find your way home if you need to, but no one else would know where you live if your GPS were stolen. Twenty minutes later when she called her hubby, from a pay phone telling him what had happened, hubby says, “I received your text asking about our PIN number and I’ve replied a little while ago.” When they rushed down to the bank, the bank staff told them all the money was already withdrawn. The thief had actually used the stolen cell phone to text “hubby” in the contact list and got hold of the pin number. Within 20 minutes he had withdrawn all the money from their bank account. A lady went grocery shopping at a local mall and left her purse sitting in the children’s seat of the cart while she reached for something off a shelf. Wait till you read the WHOLE story! Her wallet was stolen, and she reported it to the store personnel. After returning home, she received a phone call from the Mall Security to say that they had her wallet and that although there was no money in it, it did still hold her personal papers. She immediately went to pick up her wallet, only to be told by Mall Security that they had not called her. By the time she returned home again, her house had been broken into and burglarized. The thieves knew that by calling and saying they were Mall Security, they could lure her out of her house long enough for them to burglarize it. Coastal flooding and crop failures would create an exodus of “eco-refugees,” threatening political chaos, said Noel Brown, director of the New York office of the UN Environment Program, or UNEP. Shifting climate patterns would bring back 1930s Dust Bowl conditions to Canadian and U.S. wheat lands, while the Soviet Union could reap bumper crops if it adapts its agriculture in time, according to a study by UNEP and the International Institute for Applied Systems Analysis. I thought this might have been plagiarized from a grade school essay written by AOC, but then realized she wasn’t even born in 1989. Courage isn’t havinng the strength to go on – it is going on when you don’t have strength. A true leader has the confidence to stand alone, the courage to make tough decisions, and the compassion to listen to the needs of others. He does not set out to be a leader but becomes one by the equality of his actions and the integrity of his intent. 30 Mar-5 Apr: SpartanNash and Purple Heart Homes have partnered up; we’ll discuss how they’ll be helping vets. Author Adam Makin will discuss his book on WWII, Spearhead. And Diane Raver, from the Garden State Film Festival, will discuss the Movie of the Month. These comments are from a very old artilleryman. 7. It’s a lengthy article about ancient Japanese sword fighters but I can Sumurais it for you. 10. Police were called to the daycare center. A 3-year old was resisting a rest.